Maybe you like grilled cheese sandwiches? Okay, who doesn't like grilled cheese sandwiches? My kids would ONLY eat grilled cheese sandwiches and nothing else if I let them. And the grilled sandwich business is MASSIVE. Here in New England, I can go to Quiznos, Panera, or D'Angelo's for my grilled Italian sub. And, I would love to go to any of these except that I want to remain my semi-svelte self. For example, a large Classic Italian at Quiznos will set you back 1110 calories. Yikes! The small is 485 calories and I still think that is a "yikes!". So, what to do? First, invest in a panini press (or grilled sandwich maker). I got the Cuisinart one below for my 38th birthday (3 years ago) and it is still going strong. We use it around here about 3 times a week. It is super fun to use and for the price of 7 Quizos subs - you can make limitless sandwiches. I also think that this sandwich maker would be a great addition to a dorm room along with a mini-fridge to stop the late night vending machine raids (not that I would know ANYTHING about that since I attended college in the Pleistocene). The sandwich I made above is only one slice of bread, a couple slices of apple, and about 1/2 ounce of sharp cheddar cheese. The flavor combination of apple and cheddar is so delicious - and having something warm when it is cold outside is comforting. This sandwich is SO much nicer than a cold sandwich and takes about 5 minutes to make. Below I have included the nutritional information for 1/2 sandwich (which is a snack sized portion). The calorie range is going to really depend on the bread you are using, but I managed to get my snack down to 144 calories. My snack is 966 calories fewer than Quizo's Italian Sub - EXTREMELY amazing no? Please share your sandwich combinations. 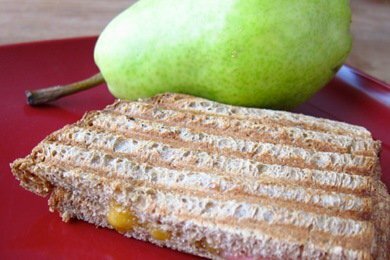 Cut bread in half, slice apple and cheese into thin pieces. Using a sandwich maker or fry pan - grill sandwich until cheese has melted and outside of sandwich is crispy. Enjoy! That is my Panini press. I bought it with spare change on Amazon (thank you Coinstar for 0 processing fees!!). Fabulous! I adore my panini press, but haven't used it for way too long. Great reminder to bring it out again, especially in the winter! I love my panini maker - got it for mother's day two years ago. We make egg sandwiches for breakfast (microwave an egg until it becomes solid; spinach; and turkey sausage)on those 100 calorie flatbreads. I'll usually add a little veggie cream cheese, and they are delicious. I've been thinking of getting a panini press. Your panini sounds great! I don't have a panini press, but I wanted to mention that you can use a George Foreman grill to do the same thing! I got one when I was single and in an apartment and held onto it for years. It now works great to make grilled sandwiches for my kids! I use my George Foreman grill for paninis all the time. Love it! I love grilled sandwiches! I've never tried putting apple in my grilled cheese, so I may have to try that next time. I don't have a panini maker, so I just use a big saute pan and I press the sandwich down with a brick wrapped in multiple aluminum foil layers. I do the same with my trusty toaster oven. I toast it open faced and smoosh it together to eat it. I use the George Forman grill to make them with whole wheat sandwich thins (a really thin bun with 100 calories). Very satisfying! My fave thing added on a grilled cheese is fresh tomato. It's heaven. Or a straight up grilled cheese, plus a big bowl of salsa for a big dip for each bite is heavenly. I love the apple idea... i'll have to try that! I have that same press - it was a gift for mother's day! Can it double as a countertop grill? I have a similar panini grill - Wolfgang Puck - I bought years ago on an impulse from QVC, best purchase I've ever made! It has switchable plates for griddle and waffle iron as well if you want to cook on other surfaces. When I had a bigger apt. it was countertop 24/7. I use a Forman grill and have been experimenting with adding veggies. I don't get enough because I still maintain a strong dislike of them. For breakfast grilled cheese on a croissant with (briefly steamed) broccoli florets and a tiny sprinkling of Italian seasoning. It was very refreshing. Plan on trying it again when I can get into my kitchen. Wonder if using Dave's Killer Bread would cut down the calories?! I Love his 65 calorie bread:-).